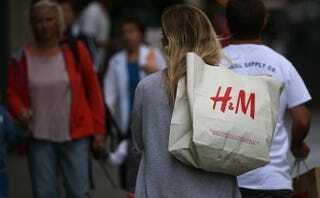 A shopper carries a bag from H&M on Aug. 13, 2014, in San Francisco. The fashion industry has never been known as a bastion of diversity, but talk about letting the proverbial cat out of the bag: H&M apologized last week for a comment on Twitter that said white models portray a more “positive image” for the brand, according to Eyewitness News. The apology came after social media user Tlalane Letlhaku tweeted H&M South Africa, asking workers to please include more black models in its global marketing campaign. The company tweeted back that its workers make selections that “convey a positive image” in its stores. Here is the apology. And is it enough? Clearly the negativity represents a mindset that does not disappear with a simple apology. Read more at Eyewitness News.